"My family loves these eclairs and request them all the time. I usually make them as dessert whenever we have company coming, they are always a hit!" 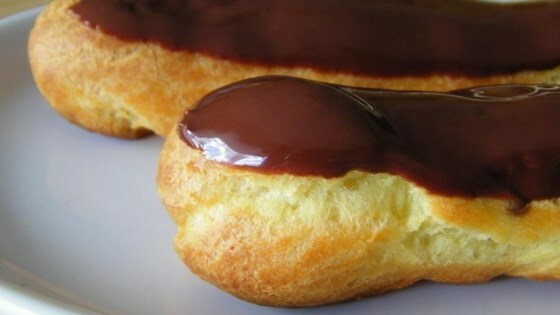 Instead of pudding, you can fill the eclairs with a combination of pastry cream or whipped cream. You can find lots of pastry cream recipes on this site. For a very fancy presentation,I baked it in a bundt pan.Just slice in half and spoon filling in. Replace top of puff, and add chocolate. I did not actually make this recipe, but I used the chocolate icing from it in something else. If you're looking for a great chocolate icing, you can't do better.